SecureVideo - How do I schedule a session with support? A technical support or orientation session is a live videoconference session with a senior support agent, and is available Mondays through Fridays, between 6:30am and 5:00pm U.S. Pacific Time. Technical support and orientation sessions are complimentary to both account holders and non-account holders, and are used to learn more about the system, check videoconferencing equipment, or troubleshoot technical support issues. NOTE: If scheduling a session less than 1 hour before the session start time, please give us a call at (888) 540-2829 to be sure that a support agent can be available to meet with you. 1. 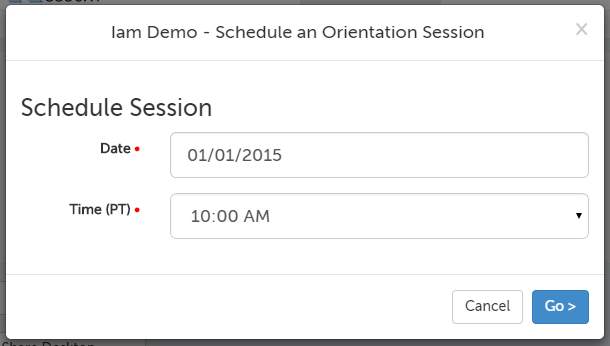 On the "Videoconference" tab, use the "Orientation Session" button. 2. A message will appear describing what an orientation session is. Click "Request orientation" to continue. 3. Set a date and time that is within our orientation hours. Then use the "Go" button in the lower right hand corner. 4. The support team will have been automatically added as a participant. At the time of the session, start the session as you would any regular session. Please give us a call at (888) 540-2829 if you run into any questions! Give us a call at (888) 540-2829, or send us an e-mail at [email protected] to let us know your availability and the reason you would like a session (e.g., demo the system, practice connecting, check your equipment, troubleshoot an issue). This article was last reviewed by our Support team on September 27, 2016.